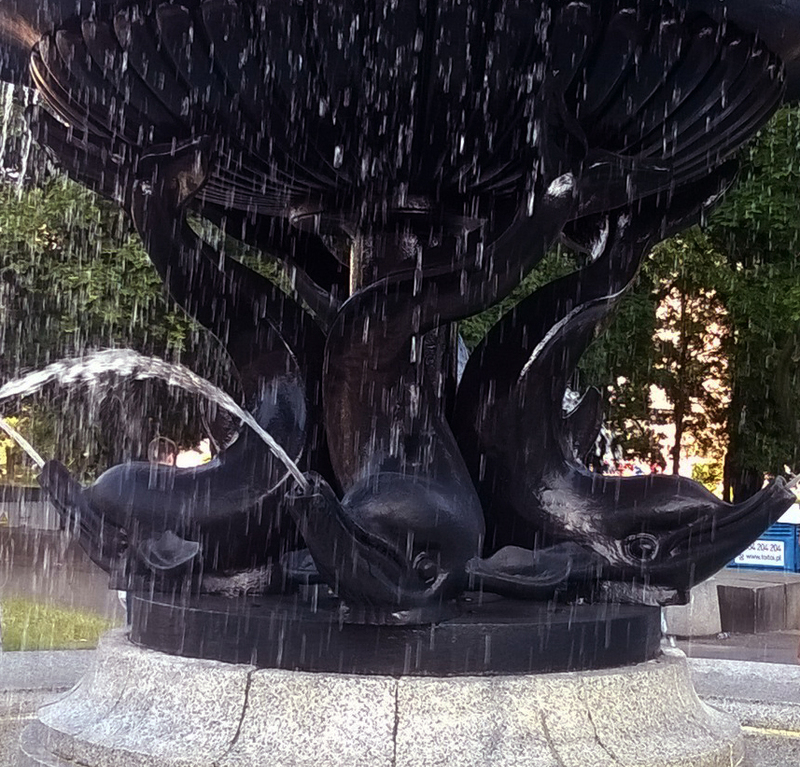 This photo is not a great photo and, as my son put it, is boring, but when I saw this fountain I had to snap it. I recently learned that my spirit animal for this part of my life is a dolphin. I love dolphins and think they are highly intelligent, so I am happy to accept such a guide. I took the appearance of the dolphin as my spirit animal to mean a return to the source, a return to my true nature and true self, which is a path I have been on for some time. This for me was a confirmation that I was on the right path. At the age of 18, I began having vivid dreams of water, being at beaches and being swallowed by huge waves. Each dream was a bit different, but most of the time I ran from the water. This dream recurred for over a decade, and then a few years ago I had a dream that I like to think of as the final chapter. I have not had this dream ever since. In this last dream, I was once again on a shore. The sky was cloudy and there was gray everywhere. Everything seemed muted and almost colorless. I found myself in the water, quite deep, and that is when the waves started coming over me. I struggled and had a hard time coming up for air. Another me told me to stop struggling and go with the flow. Once I did, the water calmed. I think this is the message of the dolphin. Do you have a spirit animal(s)? I was nominated to take part in this photo challenge by Geoff Le Pard, who tells the most interesting stories and takes us on wonderful walks, as well as the talented and amazing Sacha Black. I nominate Ellie of A Writer’s Caravan to take up this challenge. Ellie writes insightful and personal posts with their own soundtrack. I can’t wait to see what she comes up with. Good to hear. It’s quite possible that just my son finds such things boring. I think this is a lovely photo and even more so now that I read the connection that you have to it and the dolphins. There is this raven that seems to be around me quite a bit lately. I was alarmed at first until I asked my sister’s aboriginal mother-in-law about it and she told me that the raven links our energy and magic allowing us to turn ideas into reality.They show us our darkest sides and fears and help us to heal them. She went into great detail and now I’m feeling very good when I see him perched on my fence post or flying near me while I’m driving down our road. Thanks for sharing this photo and your spirit animal. A raven came to me in a dream several years ago before I began intensive group therapy sessions. Afterwards, I began noticing many ravens and even speaking to them (I know it sounds crazy), and I went through a phase of discovering and healing my darkness at that time, so that description vibes with me. Animals can give us so much if we only listen. It doesn’t sound crazy at all. Thank you for sharing that. I agree completely. fascinating; a dog, I expect. I’m instinctively loyal, always want to please ad love simple things like eating and play. Oh and I sleep at any chance I get. We don’t need to discuss an excess of shaggy fur, drool or my tendency to mark things (not in a traditionally canine way, more by dint of many accidents). You are too funny, Geoff. Our spirit animals are often not what we expect and they always come to us to give a specific lesson. And we have more than one. Mine have usually come to me in dreams, but this one – the dolphin – came to me in a women’s circle during which we drew cards from a special deck. Like a Daemon from the Amber Spyglass? It’s a beautiful fountain. The beauty of it is that in looking at it, we can let our imagination go in so many directions. Interesting – how did you find your spirit animal? During a Red Tent workshop for women. We had to pick cards from a deck (without seeing what was there). I’ve had others come to me in a dream – deer and crow. I find this fascinating. I would love to know what mine are. What a beautiful spirit animal to guide you. They all are, of course, because like you said they are often surprising — animals you need rather than the ones you expect. I’ve had books and cards since I was 15. (Which seems like an awfully long time ago now.) So…breathe. One of the messages of dolphin. Do you know your spirit animals, Sarah? Ugh. Years ago, I knew all of them. I used the Native American method that gave me nine totem animals. And I have them all written down somewhere. They are my life guides. (Mayhaps that is why my life is a disaster right now? I shall try to find that list.) Anyway, for years, I chose one animal from the deck as a daily guide or did a larger reading if there was an issue I needed help with. Do you recommend a particular book or deck? The Druid Animal Oracle Deck by Philip & Stephenie Carr-Gomm has gorgeous illustrations I think you’d love (the reading based, obviously, on Celtic lore). My husband loves Power Animal Oracle by Steven D. Farmer which is kind of a mash-up of cultures and traditions. My favorite–the one I love, and have had for over 20 years, is Medicine Cards by Jamie Sams and David Carson. We used the Medicine Cards during the workshop I was in, so since you are the second person recommending them I think I have to get that. I’ve always been fascinated by spirit animals. I liked what I read in the book about dolphins and their message. When I was a child I held an imaginary school for wolves. 🙂 Does that count as an early inkling of my spirit animal? Wolves are predators, strong yet graceful, and greatly misunderstood by both those who love them and hate them. In a way, I feel like I’m on a quest to better understand wolves, something akin to better understanding humankind. I like your message from the dolphins. Was it a turning point for you in your creativity? I think so. Wolves are definitely misunderstood. On top of what you said they are also very loyal and family-oriented. Actually, yes, that realization of the message from the dream (before I connected it to the dolphin) was the spark I needed to get back to writing.